The CDCN Series has been discontinued. Please see the CDTX-111/CDTX-112 Series as a possible alternative or contact our Flow Engineering Department. The CDCN10 Series is specifically designed to measure conductivity/dissolved solids and pH in cooling towers, boilers, industrial process water, food processing, drinking water and wastewater treatment applications. The CDCN10 Series conductivity/pH controllers are highly accurate and easy to install and operate. Engineering units can be displayed in either US or metric values using the pushbutton keypad and the simple scroll-through menus. Both units control conductivity, with the ability to control 3 additive feed programs. You can get a readout of the probe temperature. 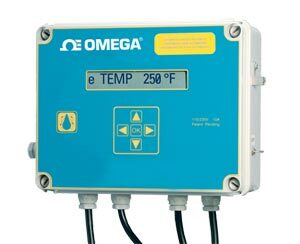 pH measurement and control is optional on both units, as is a safety flow switch contact, and RS485 communications. The CDCN12 has additional features over the standard CDCN11, including dynamic probe failure testing for pH/ORP sensors, allowing the controller to detect a probe failure quickly after it occurs, so the user can avoid dangerous out-of-range conditions. For convenience, the CDCN12 features a large 4-line LCD readout and 16-button keypad. 참고: Comes complete with operator’s manual and 3V lithium battery. When ordering the conductivty or pH controller, it is recommended to purchase pH buffer solution, such as PHA-7, pH buffer 7 and conductivity standard solution.